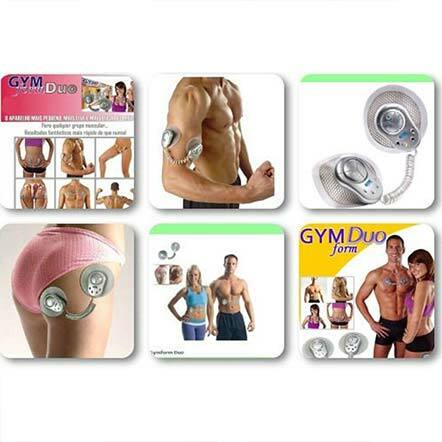 With its novel technology Gymform Duo enables you to shape your muscles easy and fast. • Your muscles are stimulated twice, with up to 100 exertion and relaxation impulses. That way you will get your desired results twice as fast. 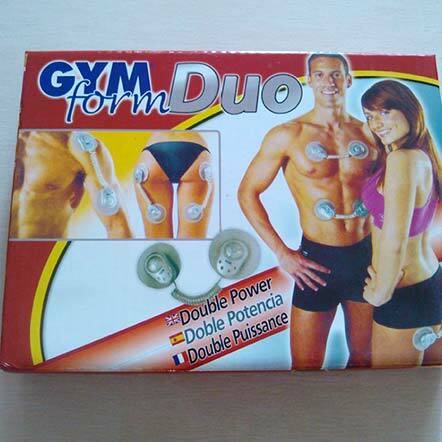 • Gymform Duo stimulates and trains your muscles, and thanks to the additional massaging effect your skin is tightened and supplied with blood. • Gymform Duo works without the need for creams, and free of any hindering cables. • Simply apply it to the body parts that you want to train, and switch it on. Gymform Duo is very handy, enabling you to reach and train all problematic areas. • No creams, no cables! Featuring 6 different programs and 10 intensity levels on each, Gymform Duo can be perfectly adjusted to your personal needs. Thanks to the small size and the low weight you can simply put it in any bag and carry it with you. That way you can train wherever you are, without interrupting your fitness program. You can even wear Gymform Duo underneath your clothes, using it to get in shape while watching TV or while you are on the road. • The easiest, fastest and most convenient way to achieve the body you desire. • Now you can tone and sculpt your whole body without spending long hours at the gym. • Not everyone is willing to go through surgery, and it does cost an arm and a leg. • But with Gymform Duo, its just as effortless, its pain free and it wont cost you a fortune. • The secret is in its breakthrough technology. 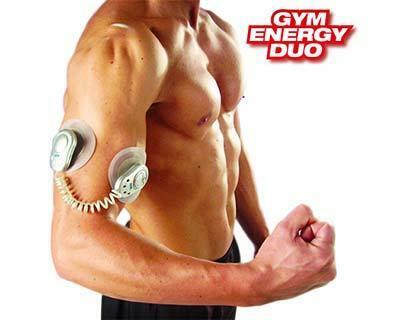 A powerful, highly efficient dual-contact muscle stimulation system that achieves amazing results. • Normal electronic exercisers send only one signal to the muscle that creates a simple muscle contraction. • But the Gymform Duo revolutionary system sends a continuous positive and negative resistance to the muscles, to create reciprocating contractions. Thats double the power. Double efficiency. Double effectiveness. And double-fast results. • Forget about complicated, outdated systems with those messy cables or those expensive gels and sticky creams. With Gymform Duo cutting-edge wireless technology, you get pure convenience.